The TJ Treasure Hunt - Final Stop! Welcome! You have arrived at the last stop of the August Technique Junkie Newsletter Treasure Hunt. If this is your first stop, I suggest you take a minute or two to go to the Technique Junkie Design Team Blog and follow our path. You may just be the winner of our great prize package! If you have followed the path all the way through, you will need this letter: X. It is the final clue to the 4 word "key" that opens the treasure chest! As you may know, the cards on the blogs in the Treasure Hunt were all created with techniques from the TJ 7th Edition CD Bonus Techniques, and all of them feature our fabulous vendors. (You can pre-order YOUR copy of the CD today! Details are HERE). My card today is no exception! I created my card using the Starry Night Technique -- again, one of the bonus techniques from CD7. 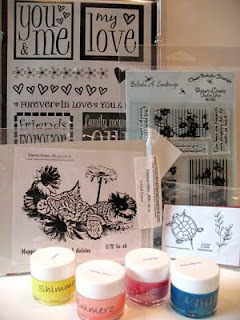 The adorable stamps used are from Clear Artistic Stamps (Remember, Technique Junkies receive 15% off! Check my sidebar for details). Hey, want to know what you can win with this giveaway? First, this package, which includes stamps from See D's, Innovative Stamp Creations, Clear Artistic Stamps and Firecracker Designs by Pamela, PLUS a package of 4 Shimmerz paints: And these stamps from Sweet 'n Sassy Stamps: PLUS a copy of the new CD (Note that if you pre-ordered it, you can have another copy OR I will refund the cost of the CD!). Okay, this post is long enough -- let me tell you how to enter! First and foremost, leave me a comment below with the "key" to the treasure box (the 4 word phrase that you collected along the way). Note that your comment will NOT show up -- I have comment moderation on because of the "key." Make sure that you leave enough information so that I can contact you to let you know you won. Just a reminder that Blogger does NOT leave me your email address. A great way to do this is to leave your email address in a spelled-out way, such as "p huntoon at optonline dot net." I will use my handy random number generator to pick the winning entry. You do NOT need to be a TJ subscriber to win. Comments must be entered by 9am EST Friday September 4th. Good Luck! Congratulations, Gail Beezley! Gail is the lucky winner of this fabulous prize package! PS: Remember to mark your calendars for next month's Treasure Hunt on Monday, September 28th! Our treasure hunts are scheduled for the last Monday of every month. In September, we will be previewing the techniques from the October 2009 issue! The Treasure Hunt is coming! Monday, August 31 marks our second treasure Hunt/Blog Hop! The fun begins Monday at 12 noon EST on the Technique Junkie Design Team blog: http://techniquejunkies.blogspot.com/ our second Treasure Hunt will begin. We have a huge Treasure Chest of goodies to giveaway while we preview some artwork from the Technique Junkie Newsletter CD7 Bonus Techniques! 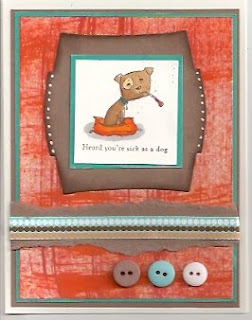 Come join us Monday to see all of the fun new things the Technique Junkie Designers have to share! Today's Blogger's Challenge was a sketch challenge (on the right). I chose to use t his adorable dog from the SU's Wellness Wishes set over a Brushed Ink Background (August 2009 Technique Junkie Newsletter). I have to say that the colors I used are far outside my comfort zone! I made the Brushed Inks Background yesterday, and I knew I was using it...so I just browsed my (too big) ribbon selections and came up with the ribbon. I just made the rest of the card to match! I like the way it looks. My sick little puppy was colored with Copic Markers and the brown piece behind it is a Spellbinders Die. If you have a few minutes, check out the other Blogger's Challenge player's cards. You won't be disappointed! Have a great weekend! Luxurious. That is all I can say about the papers I used for the card sample for today's giveaway. 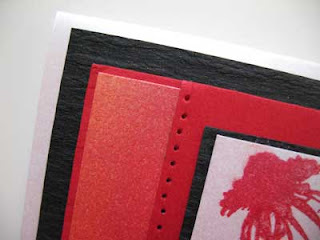 Our sponsor for the giveaway this week is The Paper Temptress. One lucky winner will receive a $25.00 gift certificate to spend in the Paper Temptress store! 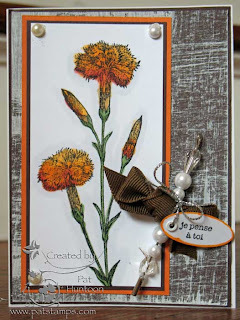 The card above is an example of the Brushed Inks Technique from the August 2009 Technique Junkie Newsletter. Instead of regular glossy paper, I used Ice Pearl Glossy from the Temptress! 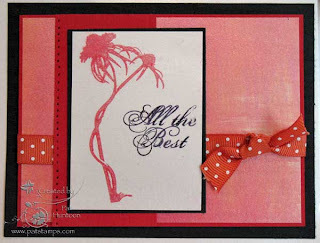 It is so beautiful in real life -- the inks sit atop the pearly paper and it is just gorgeous when tilted this-way- and-that : ) The silhouette flower, from I Brake for Stamps, and the saying from Stampin' Up! are stamped with regular dye ink on the Ice Pearl Glossy, too. To add to the luxurious feel of the card, I layered with Red Pepper Classic Columns and my favorite, the Black Crepe Ruche Textured paper. I took a picture of the papers close-up so that you could see how beautiful they are, too! So how do you become the lucky winner of this giveaway?To win this card and the gift certificate, simply leave a comment by Sunday, August 30th at 9am est. Tell me what your favorite Paper Temptress paper is! The winner will be selected on Monday morning. Make sure that you leave enough information so that I can contact you to let you know you won. Just a reminder that Blogger does NOT leave me your email address. A great way to do this is to leave your email address in a spelled-out way, such as "p huntoon at optonline dot net." I will use my handy random number generator to pick the winning entry. You do NOT need to be a TJ subscriber to win. Good Luck! Congratulations, Darlene LeMar! You are the lucky winner of this gift certificate. Happy Shopping! When you have teenage boys, no hand made birthday card is ever cool enough. I am always trying to impress my kids with their birthday cards!My soon-to-be Sixteen year old son is VERY hard to impress. Don't get me wrong, he enjoys my stamping work -- just not when it comes to cards made for HIM! This card was made for his birthday. My oldest baby is turning 16 -- soon to be driving. How did this happen? I am still 30 at heart, so I must have been VERY young when I had him. But I digress...the Blogger's Challenge was to make a birthday card, so I used a Starch Smoosh background (August 2009 issue of the TJ Newsletter) with some Impression Obsession stamps. 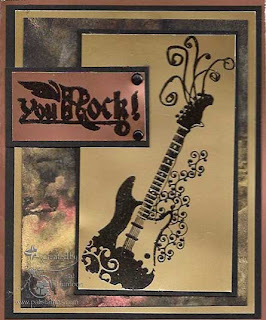 I hope I at least get some appreciation from him for using the gorgeous metallic paper from The Paper Temptress!! Hopefully, shimmer will impress him where my skills cannot. 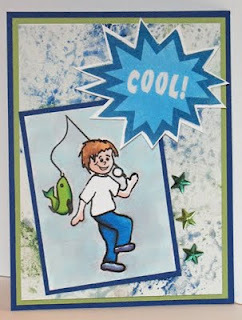 Make sure to check out all of the artwork from the other Blogger's Challenge players -- the link is on my sidebar. Today I am doing this giveaway under duress. 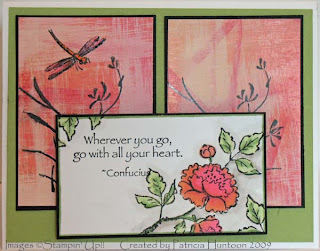 The colors, combined with the Two Nancy's Art Stamps, plus the embellishments (which took me 20 minutes to make- ouch! )....whatever it is.... It just "does" it for me. Have you been to the Two Nancy's site recently? You should go take a look! TJ members get a free gift with purchase -- AND the August Special is FREE SHIPPING on any order of $30.00 or more. Use coupon code freeafter30 (no spaces, all lowercase). So how do you become the lucky winner of this giveaway? To win this set and card, simply leave a comment by Friday, August 14th at 9am est. (In your comment, You can try to make me feel better about giving away the card, if you want...) The winner will be selected on Friday morning. Make sure that you leave enough information so that I can contact you to let you know you won. Just a reminder that Blogger does NOT leave me your email address. A great way to do this is to leave your email address in a spelled-out way, such as "p huntoon at optonline dot net." I will use my handy random number generator to pick the winning entry. You do NOT need to be a TJ subscriber to win. Good Luck! Congratulations, Barb Presley! You are the winner of this set and my card! It feels like it has been forever since I completed a creative project from start to finish! Since coloring 1000 pumpkins or 2000 frogs in the CHA booth while demoing for Copic in their booth doesn't exactly count as creative work, I was itching to make something! I finally broke away from my computer screen long enough today to play in the Technostamper Sketch Challenge #82. It has been a VERY long time since I have played -- but I am committed to doing this at least twice a month, because playing in this challenge allows me to just, well, PLAY. 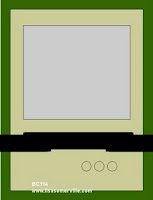 Here is the original sketch: And here is my interpretation....and it is very literal! I used the Faux Sanding Technique from the August issue of the Technique Junkie Newsletter for the coral/orange panel in the back. The front panel was colored with Copic Markers. The stamps are from Stampin' Up! 's Asian Artistry Hostess Set. It is a little hard to see from my picture but the verse and flower are popped up from the back panels. I love the way my card turned out -- and I am sending it to someone I know who approaches life with abundant enthusiasm, and who kept me up until 3am three nights in a row! 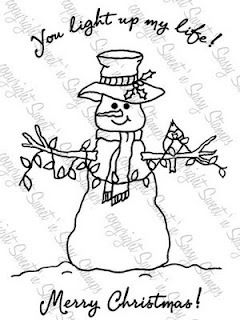 I hope you get creative today, too! Who is the lucky winner of the first TJ Treasure Hunt? Congratulations to Debbie -- she is now a Technique Junkie for LIFE! Debbie correctly found the clues to the hunt to spell "Just Gesso" -- and her number was selected by our handy random number generator.